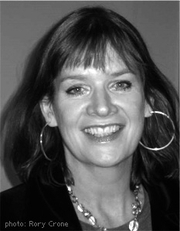 Sharon Kendrick was born in England, and grew up near Heathrow Airport. She has been writing stories for as long as she can remember and completed her first book at the age of eleven. It featured identical twins fighting evil at their boarding school, but sadly this early manuscript has been lost. Sharon wanted to be a journalist and so enroled on a secretarial course to learn shorthand and typing, but life kind of got in the way and she drifted in and out of a succesion of jobs. She has been a waitress, a cook, a dancer and a photographer. She has worked in shops and sung in bars and she qualified as a nurse and drove an ambulance across the Australian desert! When she settled down and married her dashing doctor, she decided life was not a rehearsal and that if she wanted to write a book she'd just have to sit down and do it. Not easy with a lively toddler and a six-month-old baby while living in a tiny apartment. But she did it, and so Nurse in the Outback was born, and it was accepted by Mills & Boon without any changes. Since then Sharon has gone on to write many books for Mills & Boon and they have been published worldwide. She adores writing romance and considers herself lucky to have the best job in the world! It is a fantastic way to spend a day - inventing gorgeous heroes and complex, interesting women and charting all the ups and downs, the highs and lows of their relationship until they are really ready to let love into their hearts. She intends to carry on writing for ever and why not? For what greater pleasure could be gained than when a reader writes to tell you that you moved her to laughter and tears? Sharon's interests are chocolate and music, fresh flowers and bubble baths, films and cooking. Sharon regularly visits London and Paris and lives in Winchester, England. Sharon Kendrick is currently considered a "single author." If one or more works are by a distinct, homonymous authors, go ahead and split the author. Sharon Kendrick is composed of 2 names. You can examine and separate out names.